Anyone who has followed my work knows that I thrive on constraints and creative rule sets, whether they are conceptual underpinnings or restrictions on instrumentation. This this way, this album isn’t much different than my previous ones. What’s different is that I wanted to create an album whose sound sources were exclusively objects that I found or made myself. I wanted to return to the world of vibrating objects and moving air, driven by muscle, sinew, bone, and breath. Interest in this approach sprang from years of field recording, some prepared guitar work I did from 2014-2017, and a film score project (as yet unreleased) that featured a lot of melodic and rhythmic work with found objects. When I started to constantly use my guitars with open tunings like DDDAAD, I wondered why I was using more than one string at a time in the first place. So, I thought to myself: Let’s try making an instrument that fit the way I wanted to play. I had no woodworking skills, the barest minimum of hand and power tools, poor soldering skills, and no experience doing instrument design. I had to keep it simple. So I built one instrument. Then another. Then another. And things progressed from there. Many of the materials were reclaimed: I scoured salvage yards for resonant metals and scrap wood, and went into my own shed, kitchen, and recycling bins for components. The designs were kept primitive and simple, as were the compositions, as part of a broader concept. This is also my tenth solo release, my eighth full-length album, and my first double cassette. Themes, influences, and concepts behind the music and the packaging are for the listener to discover, but certainly there are clues throughout the music and track titles themselves. I built every instrument used on this album, along with a handful of found objects. No samplers (or other samples), synthesizers, guitars, drums, or other commercially available instruments were used in these recordings. The primary instruments were two “diddley bows,” American folk instruments that are essentially one-string, fretless instruments, normally played with a slide like a lap steel guitar. One was made with a normal-weight guitar string, and the other with a massive low-B bass string. 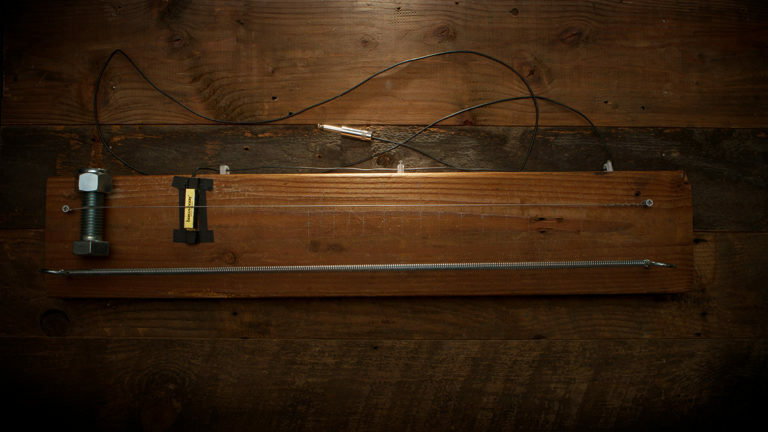 The “alto” diddley bow was miked with a Barcus-Berry 4000 contact microphone and had a stretched spring on to act as a light spring reverb and a percussive element when played. 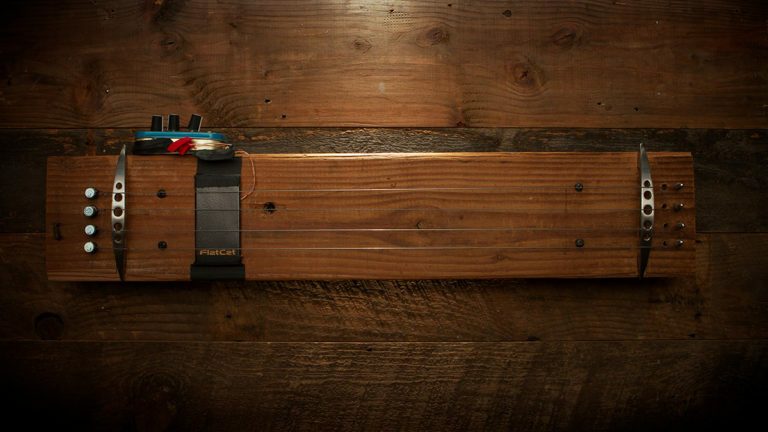 The “bass” diddley bow had active EMG pickups, whose extra power and sensitivity were a perfect choice, since the string sat much farther away from the pickups than normal. This was run through a bass SansAmp pedal running on phantom power. Both were also recorded acoustically using a wide array of microphones. Other instruments included a four-stringed koto, which I later modified into more of a traditional dulcimer; a kalimba made from a bamboo box and bobby pins; a board covered stretched springs; two 12” frame drums made of cardboard and packing tape, one with custom snare wires; a rattle made with steel can lids; rusty hinges; a polycarbonate bear canister; a gong made of perforated steel; bells made from aluminum water bottles and scrap metal; and long lengths of rain gutters, PVC pipes, and aluminum tubes. 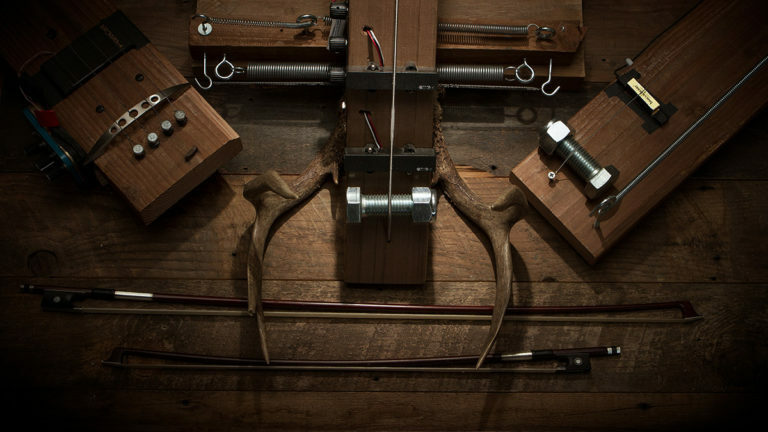 These instruments were played with a cello bow, E-Bow, plectrum, fingers, lap steel slides, carbon fiber rods, rubber mallets (also handmade), and objects mounted to small motors, voltage-triggered solenoids, occasionally prepared with alligator clips and other objects. My greatest compositional challenge was coming to terms with single-string, unfitted instruments. Sometimes I played pretty melodically with a slide, and other times I just let the hypnotic repetition of one note lead the arrangement, using layering to build complexity and depth. No samplers (or other samples), synthesizers, guitars, drums, or other commercially available instruments were used in this recording. Granted, there is a lot of software processing going on, but as streamlined as recording directly into the DAW was, with microphones and such, adding anything else into the arrangement possibilities would have added a lot of drag onto the recording sessions. This was the defining influence on the album’s compositions, sonic character, and creative process. The recording was done in my studio, my garage, and several reverberant outdoor locations from late winter through mid-spring 2018. In the studio, I would record direct into an audio interface, using traditional microphones, contact microphones, and a variety of 500-series microphone preamps. In the field, I would record using a click track on a smartphone while recording mid-side stereo into a field recorder, sometimes using a 30-year-old cassette field recorder for saturation and grime. 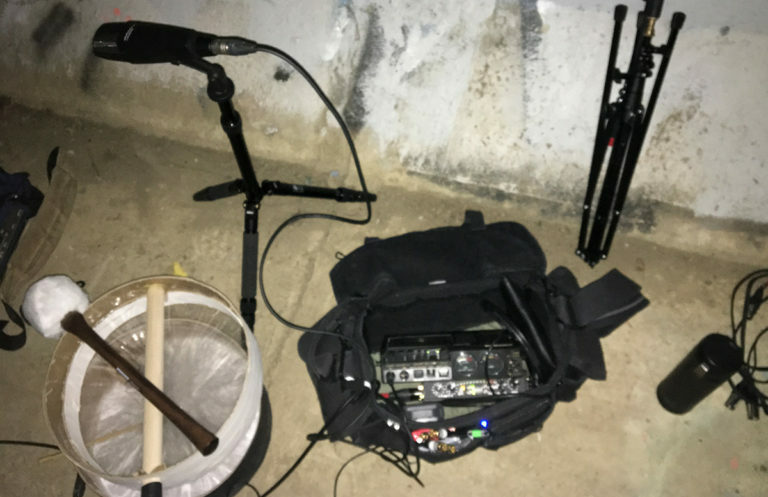 Pre-dawn recording sessions (to avoid traffic noise) in a local underground tunnel were especially memorable. And by memorable, I mean cold. Special thanks goes out to Michael Raphael of Rabbit Ears Audio who let me borrow an Awesome Transistor Amplifier Company (AwTAC) Channel Amplifier, designed by his brother, Dave; its design is based on all the best attributes of 1970’s preamps, and its EQ section is stellar. This added a lot of character to the recordings. Other preamps included Neve, Purple, and API, which I selected based on the material being recorded. The trick to using contact microphones is impedance matching; improperly done, contact mics sound brittle and thin. Very few preamps exist that have megaohm-class impedance (most only are hundreds of thousands of ohms, for instruments like guitars), but I discovered Triton Audio’s BigAmp Piezo, an inexpensive inline barrel preamp that really made this recording possible. I now own four! Most songs were recorded in half a day, while took several days. Track counts ranged from four to 30 (the latter being a personal record for any released song). All of them got extensive remixes after I sat with them for a few days. Only a handful of effects pedals were used; most effects were added via software, though some reverb was from recording in the field. ValhallaDSP plugins, as usual, are all over this release. Don Gunn helped with some mix reviews to ensure I wasn’t totally screwing things up. Mastering was done by myself, largely as a function of budget. Normally I do surgical work digitally and broad strokes with hardware, but this time it was all hardware except for limiting. Tube compression, tube EQ, and analog mid-side EQ were the key tools this this around. Because objectivity is everything in mastering, I let the final mixes sit for an entire month before doing any final polish. Since the instruments were all handmade, it only seemed right that the packaging was, too. My artistic collaborator Corey Holms designed a sigil based on my creative direction; I was going to get stamps made for the tape sleeves, but he encouraged me to make the stamps myself (which I did using linocutting techniques), and to use bleach instead of ink (which we also used in making t-shirts). He also encouraged me to make multiple stamps and scanned prints, so that every time the sigil is used, it’s different every time. Many paper samples and tests later, here’s a glimpse of the production process. Corey has absolutely become a member of my creative team and everything he’s involved with turns to gold. Having been a sound designer for over 10 years, I’ve been encouraged by others to create sound libraries, but in a crowded market it was hard to find a sound source or idea that was unique. The Right Side of Mystery proved to finally be the turning point: Literally no one else had instruments like these, because I made them, and some of their most interesting attributes are atonal, gritty, and eerie. 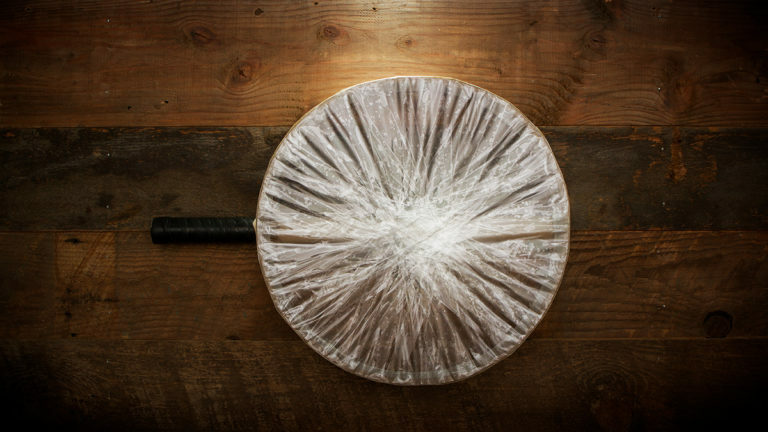 And I was endlessly interested in what others might do with this material. So, released two collections of sounds made with the instruments simultaneously with the album. One is Sigil, a 24 bit, 96 kHz library for sound designers featuring over three hours of material, available exclusively on ASoundEffect.com. The other is a set of Creative Commons 24 bit, 48 kHz reels for the Make Noise Morphagene Eurorack sampler module. I’ve not sold off any of my electronic instruments; they remain a key part of my workflow and tool set. But the visceral nature of playing real objects and instruments is hard to walk away from, and those two worlds will intersect a lot in the next year or so. Several projects have spun up as a result these recording sessions, suggesting an ever-widening mix of instrumentation in my future work. The character of my next few projects will vary widely, which I find incredibly exciting and very challenging…but, as in all things in our world, the only constant is change. I hope you’ll continue to join me for this journey.